« Seaside Heights. Beginning to button down as fall tiptoes into town. Remembering the Battle of Gettysburg and the symbols that remind us of its meaning. Confederate cannon on Seminary Ridge. Gettysburg National Military Park. Paul Goldfinger photograph © Click to enlarge the photo. Tri-X collection. By Paul Goldfinger, Editor @Blogfinger.net. Re-posted from 2017. Reading Lincoln’s statement about “a new birth of freedom,” I was thinking about the divisions in our society today, 2018. At the battle of Gettysburg, there were nearly 200 cannon lined up along Seminary Ridge from where 15,000 Confederate troops under Gen. James Longstreet planned to launch an attack on the Union army—–Pickett’s Charge. The battle lasted from July 1-July 3 in 1863. The North was victorious, but there were heavy losses on both sides. This cannon was on Seminary Ridge, Confederate lines, where I photographed it during our tour of the Battlefield. Gettysburg was one of the most bloody battles of the Civil War, and being at Gettysburg is a very emotional experience. You must visit if you never have. I look at this cannon, sitting in that position and try to imagine the role, the relatively small role, that it played amidst the smoke, the fire, the heat and the storm of shells and bullets that day resulting in carnage on both sides. This cannon must have killed or wounded men that day, but now it is silenced and stands as an icon to tell a story. There are so many monuments in the Park representing all the states that participated in the battle and all the men who fought there. Should the gray side be torn down now? Looking at this canon provides the answer for me. I am drawn to it and cannot stop staring at it. I had to photograph it. I suspect Lincoln would be horrified at the idea that we should today be destroying symbols of our history. 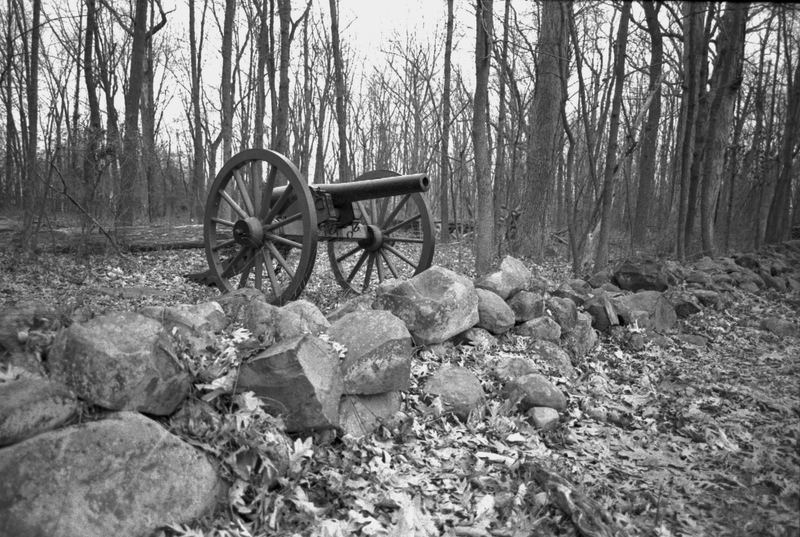 Gettysburg National Military Park and other such monumental places must be preserved even if the memory is painful for some. And, by the way, that is why Auschwitz still stands and was not torn apart nail by nail by the Jewish people. In fact huge numbers of Jews go to Europe to visit such places, and it would have been tragic if that evil death camp had been vaporized . ASHOKAN FAREWELL. From the soundtrack of Ken Burn’s Civil War. I agree. Some things need to remain to remind us—to teach us. Someday, we will begin to learn. I just hope it doesn’t take too long. Being partial to Gettysburg as I attended college there, I think that the statues should remain. Reenactments should also continue with flags carried on the battlefields because it puts them in context. After that, a line should be drawn. Peter: I’m not sure how attending college there informs your opinion. Please explain. Also, what does “After that a line should be drawn.” mean? My original answer was much longer but I lost the page when I accidentally closed it. So, in short, the battlefield helped me in my decision to major in history while in college. I could walk or drive to the different locations whenever I wanted and the plaques and statues informed me as to what happened in any given spot. The statues and plaques and flags were appropriate in that context. Robert E. Lee in some random town square or flags of the Confederacy on license plates are absolutely unacceptable. “Heritage not Hate” (bumper sticker I’ve seen in the past with a confederate flag attached) might be acceptable on a civil war battlefield but not in anytown USA. Peter: Thank you for your response. Some people believe that Confederate statues would be OK when placed only in museums, and the Gettysburg Park might be viewed as a sort of museum; and if so, your explanation of your support for statues only in the Park would be consistent with that view. But I disagree. The Park is not a museum. It is the actual setting of the battle, and the statues provide a sort of reality to the telling of the history. You may think that “heritage not hate” is unacceptable on a license plate, but it is a legitimate point of view in this debate, and your objection is merely your point of view–it is not a fact. You know, there is a Civil War cannon on the shores of Wesley Lake, brought back home by a Union soldier. The plaque says, “Civil War Memorial Cannon. 1st. Lieutenant George Potts, Civil War veteran placed this Delafield cannon on the bank of Wesley Lake in Ocean Grove, circa 1880. It was dedicated as a tribute to those who fought and died in the war between the states.” No distinction was made between the soldiers of both sides. And the same was true in Lincoln’s Gettysburg Address. So shouldn’t we be similarly charitable when we 21st century Americans such as yourself view this statue discussion? Blogfinger is not the place to have a debate between two parties, so you and I won’t go back and forth on this, but perhaps others might want to comment.